Heat oven to 475°. Cut shortening until particles are like coarse cornbread. Add soda to buttermilk and stir into flour mixture. Turn dough out on lightly floured board. Roll out and cut with floured cutter. Place on baking sheet. Bake 10 to 12 minutes. Makes 12 biscuits. 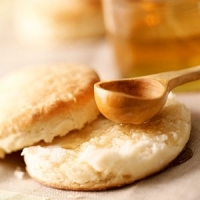 Recipe categories: Breads, Breakfast, Rolls/biscuits.